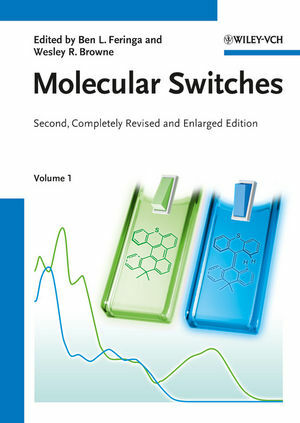 The long-awaited second edition of the successful book covering molecular switches now in two volumes! Providing principles and applications this book brings you everything you need to know about molecular switches - a hot topic in the nanoworld. The major classes of molecular switches including catenanes, rotaxanes, azobenzenes together with polymer and biomolecular switching systems and DNA based switches are covered. Chemists and material scientists interested in one of the most innovative areas of their science will benefit greatly from reading this book. Ben L. Feringa is the Distinguished Jacobus Van't Hoff Professor of Organic Chemistry at the University of Groningen, where he is also the director of the Stratingh Institute for Chemistry. His research career spans four decades and covers topics as diverse as materials science, total synthesis, homogeneous catalysis and of course molecular photochemistry with chirality as the core guiding theme in his research career which includes over 500 scientific papers published to date. For his contributions to research he has received numerous awards including the Spinoza award of the Netherlands Organization for Scientific research and the ACS Norrish Award and is a member of the Royal Netherlands Academy of Sciences and Honorary Foreign member of the National Academy of Sciences (USA). He was appointed recently as an Academy Professor of the Royal Netherlands Academy of Sciences. Wesley R. Browne is Assistant Professor of Molecular Systems & Interfaces at the University of Groningen. He completed his undergraduate and doctoral studies (under Prof. Han Vos) at Dublin City University, Ireland in 2002 for which he was awarded the Prize for Young Chemists by the Royal Irish Academy, before taking up a postdoctoral position first in Queens University Belfast (NI, under Prof. John McGarvey) and then at the University of Groningen. In 2007 he was awarded a VIDI fellowship from the Netherlands Organization for Scientific research and in 2008 was appointed to his present position as Assistant Professor. His research interests are diverse and include electrochemistry and Raman spectroscopy applied to both studying mechanisms in oxidation catalysis and to the photochemistry of molecular materials and polymers. He has published over 70 research papers to date. The editor of our book Molecular Switches, Ben L. Feringa, has been awarded numerous prizes. The most recent ones are the Lilly European Distinguished Science Award 2013 and the Marie Curie Medal, the highest honor awarded annually by the Polish Chemical Society for chemist working outside Poland. Find out more about Prof Ben L. Feringa.